Remember that California ballot initiative, which will be voted on in November, that would require labeling of all foods containing genetically modified ingredients? I first wrote about it here. Since GM corn, soy, sugar beets, and cotton (the oil part) are processed into sweeteners, fats, and other additives that suffuse the US food system, the initiative would require the labeling of something like 80 percent of all nonorganic processed food sold in supermarkets. If the California initiative passes, it will likely force food processors to label food nationwide, since it would be costly and cumbersome to have one set of labels for California and another for the other 49 states. And labels, of course, could prompt consumers to demand more GMO-free foods—and in turn push farmers to demand non-GMO seeds, imperiling sales growth for the Big Six. 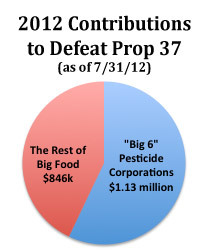 Protection money: cash raised to defeat California’s labeling proposition. Pesticide Action Network of North AmericaCue a gusher of agrichemical cash into the effort to defeat the labeling initiative. This year through June 1, hundreds of thousands in donations had already bolstered the coffers of the astroturf group “Coalition Against the Deceptive Food Labeling Scheme, Sponsored by Farmers and Food Producers,” the Secretary of State’s Office reports. In July, industry trade group the Biotechnology Information Organization added $250,000 to the till, DuPont dropped in $310,000, and BASF shelled out $126,000. Big Food companies—which would no doubt prefer to avoid labeling—came up with cash for the effort, too, in July, ranging from Kellogg ($13,080.78) to Nestle ($24,184.46) to Pepsico ($35,494.94). Paul Towers of Pesticide Action Network, who has crunched the numbers on financing for the anti-labeling group, calculates that, based on the Secretary of State’s Office’s latest release, the group has raised about $1.98 million, with $1.13 million of it coming from the Big Six and its trade groups and the rest coming from Big Food companies. He told me that he included the $375,000 donated by the Grocery Manufacturers Association under the Big Food category, even though its membership incudes Monsanto, Syngenta, Dow, BASF, and Bayer, along with food giants like Kellogg, Nestle, Pepsi, and the like. The president of the Grocery Manufacturers Association recently declared defeating the labeling proposition “the single-highest priority for GMA this year,” Michele Simon reports.